The Monastery Route or Ruta de los Conventos is focused on the south of the state where numerous religious outposts and buildings were constructed in the early colonial period for worshipping and evangelization. 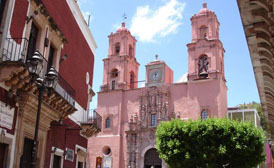 The Church of Agustino de San Pablo and Monastery is found in Yuriria and built by the Augustinians who came from the city of Michoacan in the 16th century. An amazing fortress type building designed by Friar Diego de Chávez Alvarado and Pedro del Toro, built in an area with a small population. This monastery became a heart from which missionaries would be taught and then sent to other religious centers and its imposing size and fortresses helped to protect it from Chichimeca invasions. Retaining its original purpose as a church and religious façade, however, the monastery area has been transformed into an impressive museum. Further along the Monastery Route you´ll discover Las Capuchinas Church and adjoining Convent both located in Salvatierra. This is one of only three buildings specifically built for nuns, unique in the entire state throughout the colonial period. Once again, it has a citadel like appearance and its construction is credited to Joaquin de Heredia, from the San Carlos Academy. Throughout the presidency of Porfirio Díaz, the convent was utilized primarily as a Civil Hospital and afterward as a school, which still remains today and is called Colegio José María Morelos. The San Francisco Church and Monastery can be found in Acámbaro and both were built between the years 1734 and 1743. The impressive and bright facade is Baroque of light pink stone with border accents. 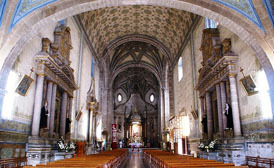 The church contains one of the most extraordinary main altars in the Bajio region of Mexico. 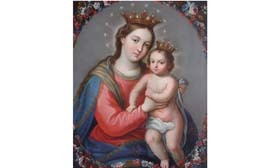 The Neoclassical construction consisting of gray and pink stone with gilded minutiae, with an portrait of the Virgin Mary Refuge of Sinners or in Spanish, Virgen María Refugio de Pecadores , an exact facsimile of one found also in the region of Zacatecas.